In addition to an overview of the current legal and regulatory environment, topics will include compliance with the rules, regulations and documentation requirements of various government agencies, including Immigration and Customs Enforcement (ICE); employers’ rights and responsibilities under new open-carry handgun laws; preparation for employment related litigation; and a review of significant employment-related verdicts in federal, state and local courts. Even small businesses with relatively few employees are now subject to a wide array of state and federal employment laws, according to Joe Ferguson, Director of the SBDC at EPCC. The seminar will be held from 8 a.m. to 5 p.m. at the El Paso Community College Administrative Service Center at 9050 Viscount Blvd. The registration fee of $175 includes a seminar manual as well as continental breakfast, lunch, and snacks. 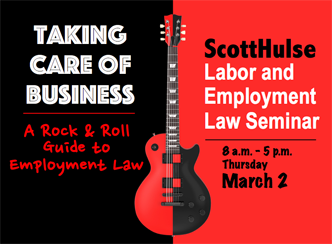 For additional information or to register online, visit ScottHulse.com or call 915-533-2493.